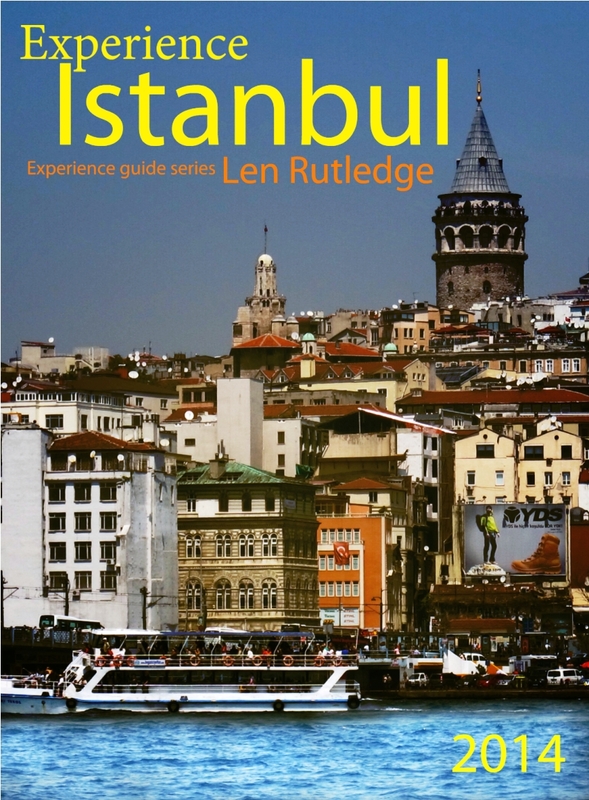 Experience Guides has started to produce short travel videos. 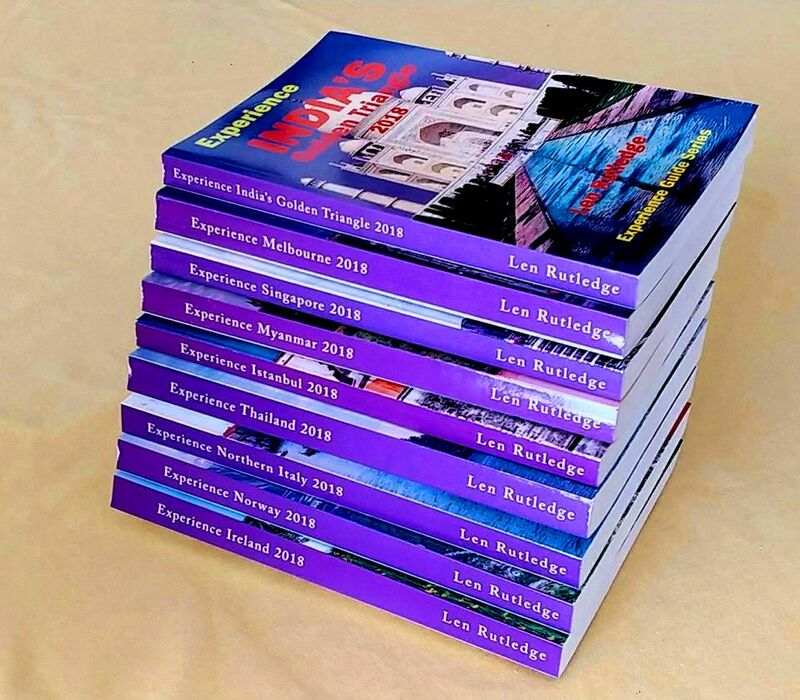 These will cover destinations that are covered by Experience Guides paperbacks and ebooks but also other destinations around the world. 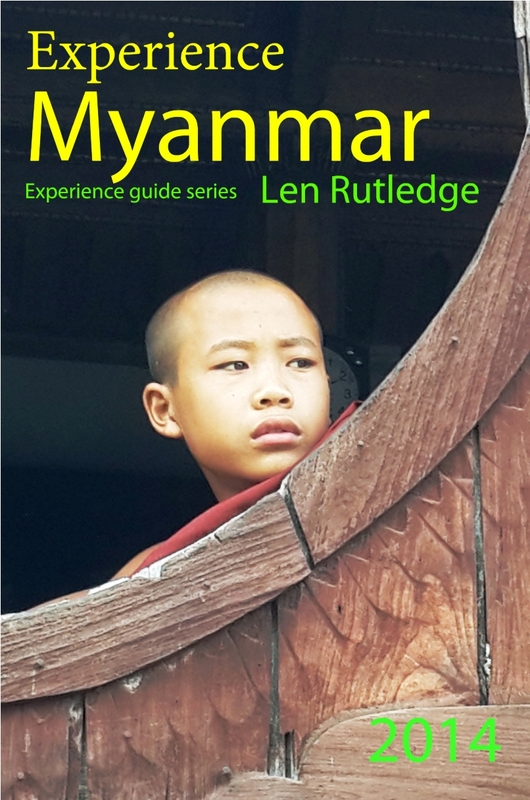 Len Rutledge discovers that in Myanmar, holy men are more revered than rock stars, right-hand drive cars (like ours) drive on the right side of the road, and friendly betel-chewing oldies show blood red teeth when they smile at you. English writer and poet Rudyard Kipling wrote about Burma more than 100 years ago. “It is quite unlike any place you know about”. He may be surprised to know that it is still accurate today. For the past thirty years Myanmar has been in the news for all the wrong reasons. The United Nations and many other organisations have condemned the county’s rulers for their imprisonment of political prisoners, use of forced labour and violent crackdowns on demonstrations. Many countries, including Australia, have applied economic sanctions. More recently, the Rohingya Crisis has brought the world’s attention back onto the country. At the same time, the government has implemented many changes that are opening up the country to visitors; most of the sanctions have been lifted; and tourism is taking off in a big way. You experience a time warp when you visit here. Many men and most women still wear an ankle-length skirt, most rural women paint their faces with a white traditional makeup and there is not yet a multitude of McDonalds, 7-Eleven or Starbucks to be seen. What you find is refreshing, humbling and slightly daunting to many visitors. If not on a packaged tour, it’s easy to get out of your comfort zone, but this helps to make Myanmar unique. While many other countries are losing their culture, here you find the gentle population is still embracing their traditions and religion like they always have. A Myanmar experience should start in Yangon (Rangoon), the largest city but no longer the capital. 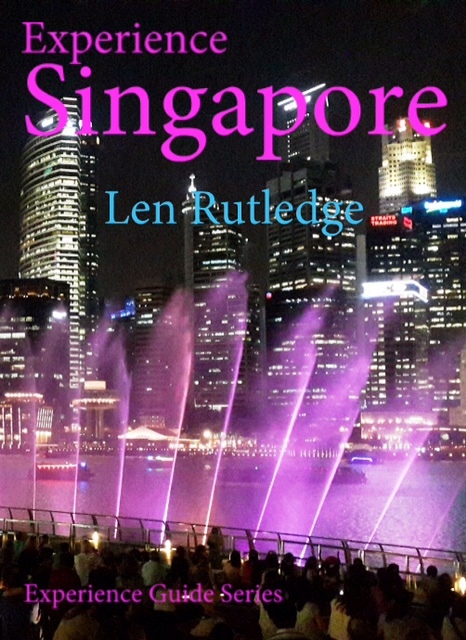 Australians mainly fly in from Bangkok or Singapore. The city is sprawling and low-rise. Many magnificent British colonial-era buildings still decorate downtown but unfortunately most are unused and are rotting away. Yangon is home to one of Asia’s most awe-inspiring religious monuments. The Shwedagon Pagoda is visible from almost anywhere in the city and is a ‘must-see’ site for all visitors. So too is Kandawgyi Lake, with its boardwalk, concrete reproduction of a royal barge, and quiet corners. The vibrant, colourful downtown streets, the open-air markets, and bustling Chinatown can provide plenty of action and excitement. That substitutes for a nightlife that is only now starting to fully develop. There are some nice hotels in the city where the price skyrockets in the tourist season. Credit cards are becoming more accepted for payment but in many places cash is still king. Bagan is probably the country’s star tourist attraction. This was the capital from the 11th to the late 13th century and the remains of thousands of pagodas and temples, dotted across the plain of the Ayeyarwaddy (Irrawaddy) River, is a wondrous sight. 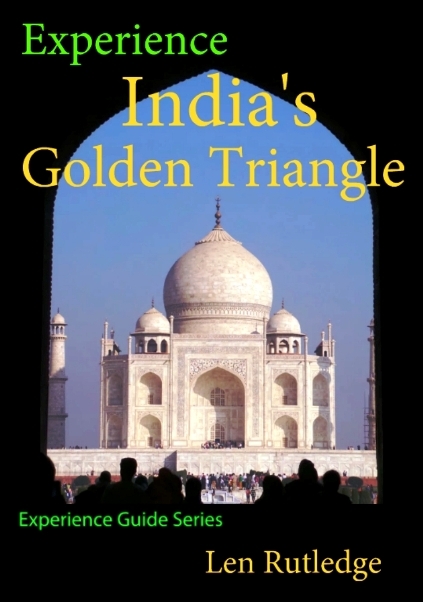 It is the largest collection of religious monuments I have ever seen and most visitors find it stunning. Bagan is nearly 700km north of Yangon so most people fly there. It is easy to spend three days exploring the temples by bicycle and horse-cart, taking a sunset boat trip and perhaps ballooning over the spectacular site at sunrise. Accommodation options include cosy guest houses and lovely riverside resorts. Try one of the small but clean Burmese restaurants which are dotted around the area to sample the local food. Mandalay is a 25-minute flight away or a seven-hour boat ride. This was the last capital before the British takeover of the country but equally intriguing are the other adjacent older capitals of Inwa, Sagaing and Amarapura. Many people think of Mandalay as traditional Burma and are then disappointed when they find a traffic-choked city full of low-rise concrete buildings on straight, dusty roads. It takes a while to discover that Mandalay is still the cultural heart of the country. 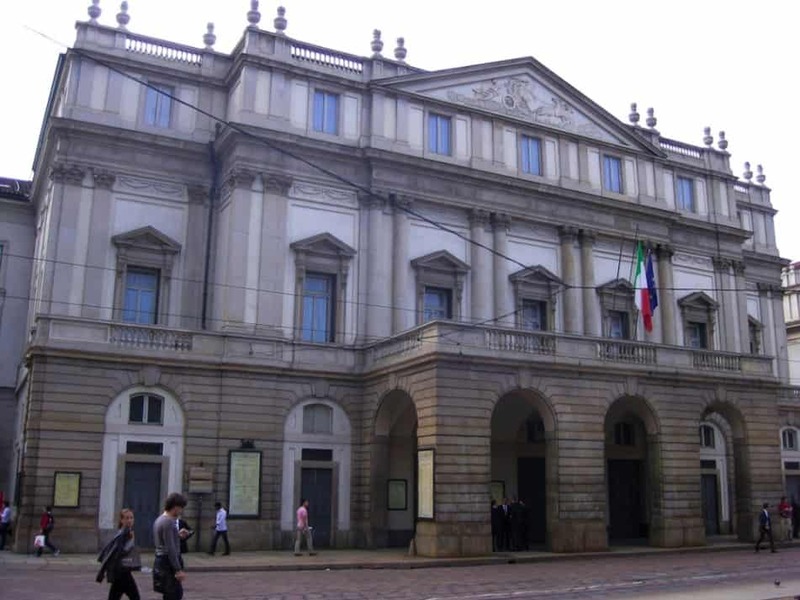 This is a convenient place to see intimate traditional dance performances and marionette shows. You can visit silk weaving factories, gold leaf manufacturers, stone-carving workshops and foundries where giant Buddha statues are made using centuries-old methods. Climb Mandalay Hill, take a boat to Mingun to see what would have been the world’s biggest stupa had it been finished, wonder at the remains of Inwa as you travel in the back of a horse-cart, and visit one of the many active monasteries that still exist. Pyin Oo Lwin was once a British-era summer capital and it is being rediscovered for its stunning botanic gardens and some of Myanmar’s best cuisine in lovely cool hotels. Further east, historic Hsipaw was once home to Shan princes but today it serves as a base for hikes into fascinating Shan and Palaung villages. Inle Lake is second only to Bagan in attractiveness. 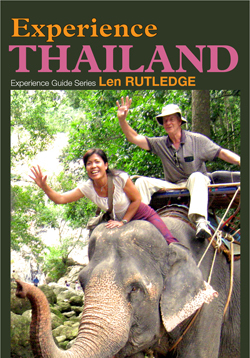 This is a region of Shan, Pa-O and Intha people and their culture and lifestyle fascinates most visitors. Accommodation is in guest houses in Nyaungshwe or in lovely lakeside resorts. From here visitors criss-cross the lake in motorised canoes visiting stilt-house villages, floating gardens, tribal markets and lovely water-bound temples. Travelling through the mist that hangs over the lake in the morning then seeing the famous one-leg rowers heading out to fish is a magical experience. To the Top of Europe from Life begins at. Mountains are to be climbed but I have never been drawn to ropes, picks, anchors and spikes. I’m more for sitting back and letting a train or cable car do the hard work for me. That is one reason I love going to Jungfraujoch, The Top of Europe. The Top of Europe is 3454 meters above sea level in the Swiss Alps above Interlaken. With a majestic backdrop of ice, snow and rock, the exhilaration of being there is palpable yet all you have to do is sit back as three separate trains take you progressively higher and higher. 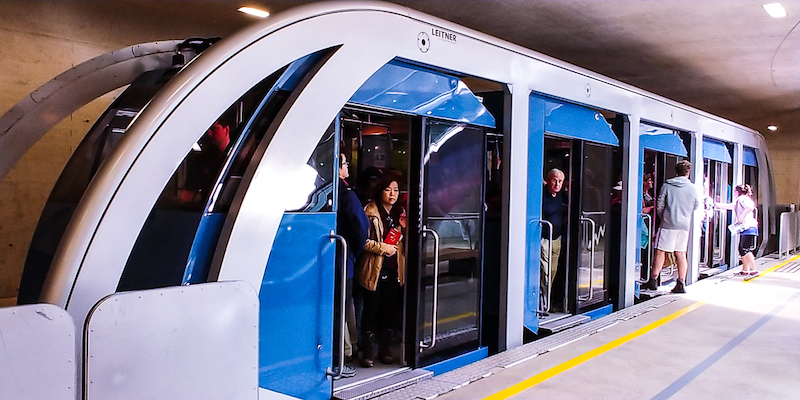 The first train starts at Interlaken East station. We chose to board one stop along the line at the cute village of Wilderswil where accommodation was cheaper, parking was easier and people were friendlier than in the city. The Bernese Oberland Railway travels from Wilderswil into the Lauterbrunnen and Grindelwald valleys. In fact, our train split a few stations later with the front half going to Lauterbrunnen and the back half going to Grindelwald. If you are going to the Top of Europe it doesn’t matter which way you go. We choose to travel via Grindelwald, a dreamlike mountain resort under the infamous North Face of the Eiger. The surrounding alpine pastures are achingly idyllic and cable-cars make it easy to reach scenic mountain lookouts, the Grindelwald Glacier and lakes. It is no wonder that this landscape has been a filming location for Star Wars and James Bond movies. From Grindelwald we catch the narrow-gauge rack railway to Kleine Scheidegg. This where the trains from Grindelwald and Lauterbrunnen meet and from where the train to Jungfraujoch departs. The scenery is dramatic as we enter the snow zone and everything turns to white. Cable cars head in all directions from remote stations and even in May some skiers are out chasing the last runs for the year. Kleine Scheidegg is the starting point for scenic hikes in summer and it is a significant winter sports centre. The train journey to the Jungfraujoch (Top of Europe) through the rock of the Eiger and Mönch is an incredible experience. The majority of this section is in a tunnel but you get to enjoy stunning views from Eismeer (Sea of Ice). The cogwheel railway track to Jungfraujoch on gradients up to 25% was completed in 1912 and has been in continuous use ever since. Arriving at the top brings new levels of anticipation and it is not long before we have icy air streams across our faces, snow crunching under our feet, and a view which nearly takes our breath away even with the cloud and fog we are coping with today. When we visited here some 25 years ago there were limited things to do at the top. Not anymore. Over the next few hours we were absorbed by the 360 degree cinematic Jungfrau Panorama, intrigued by the lights and music of the Alpine Sensation and fascinated by the huge Ice Palace where enormous caverns and passageways have been carved into the ice displaying crystal-like sculptures of eagles, bears, penguins and so forth. The high-point of any visit is the Sphinx Terrace attached to the Observatory and Research Station. 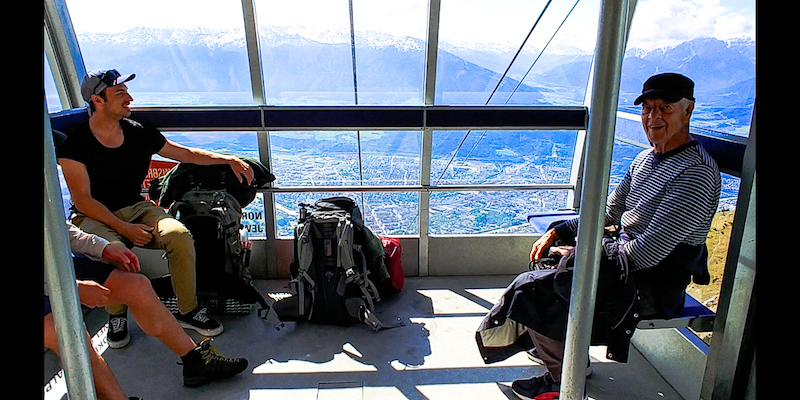 We ride Switzerland’s fastest lift to the terrace and are rewarded with spectacular views over the Aletech Glacier which is over 22 kilometres long and nearly a kilometre thick. Sadly, the views into France, Italy and Germany are masked by low-cloud and fog. Now we brave the cold and venture out on to the Glacier Plateau. It is briefly majestic but then it turns bleak, freezing cold and merciless. In better weather you can skim down the slope on snow tubes, skis or snowboards, but not today. The 250 metre-long zipline is not providing an adrenalin rush to anyone either We quickly retreat inside. Mountain air makes you hungry and thirsty so fortunately there are several restaurants and cafes. Top of the line is Restaurant Crystal but we opted for the self-service Aletsch. For those who brought their own food the Cafe Bar provided drinks. There are a few shops here with souvenirs, clothing and other items but the Lindt Swiss Chocolate Heaven seems by far the most popular. This advertises itself as the highest Lindt Chocolate Shop in the World and there are six interactive exhibits and a few products only available here. The time has come to leave so we retrace our journey back to Kleine Scheidegg then take the next train this time to Lauterbrunnen before making one more change before we reach Wilderswil. It has been a great day despite less than ideal weather and we would do it again in a heartbeat. 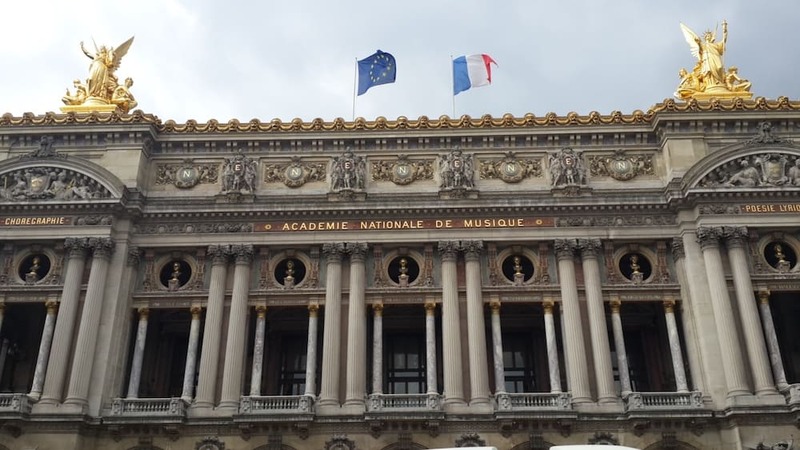 No matter where we travel there is a good chance that we will see some impressive buildings. 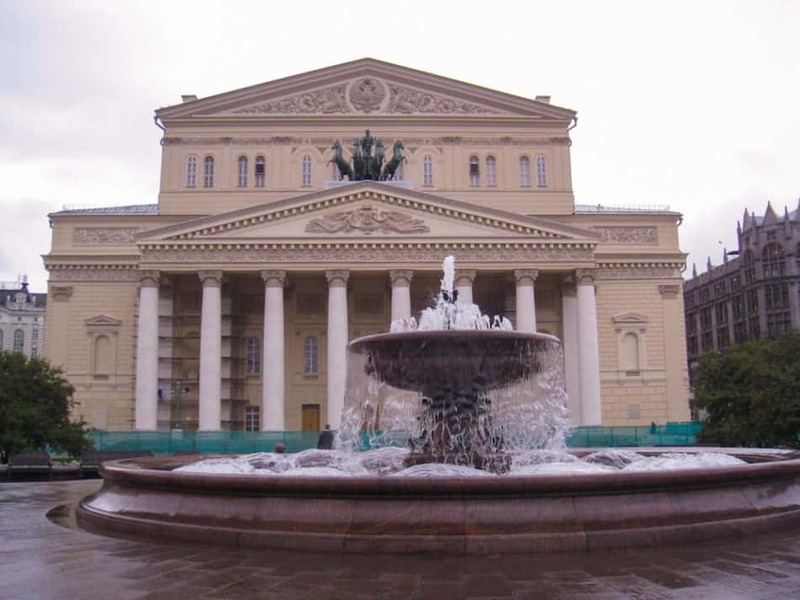 The Bolshoi Ballet is probably the most renowned ballet company in the world and it is by far the largest with more than 200 dancers. Tchaikovsky’s ballet Swan Lake premiered at the theatre in 1877 while other regulars on the Bolshoi repertoire include Tchaikovsky’s The Sleeping Beautyand The Nutcracker, Adam’s Giselle, Prokofiev’s Romeo and Juliet, and Khachaturian’s Spartacus. 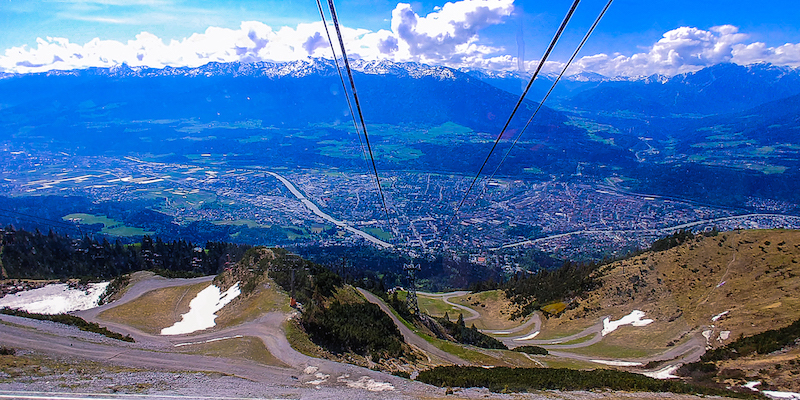 It’s a crisp, blue-sky morning as we ride the cable car across slopes of white high above Innsbruck, Austria. 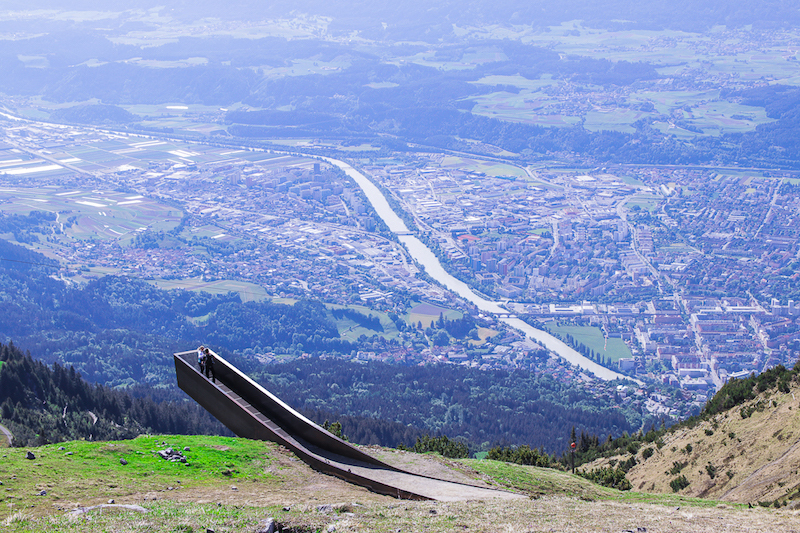 When most people think of Innsbruck, they probably think of skiing. That’s not surprising since the city has hosted the Winter Olympics twice. But this lively, welcoming and cosmopolitan city is appealing just about any time of year. Innsbruck lies in a valley surrounded by the mountains of the Austrian Tyrol. Its calling cards include medieval architecture, an interesting dining scene, and opportunities for adventurous activities. In addition to skiing and snowboarding, the city and its environs are becoming known for summer sports like downhill mountain biking, rock climbing, and whitewater rafting. But you don’t have to be an active participant to enjoy all Innsbruck has to offer! A royal palace, a cathedral, cobbled streets, and classical architecture make Innsbruck’s Old Town one of Europe’s most pleasant city centers. My wife and I spent hours wandering the streets intrigued by the beautiful Baroque Helblinghaus with its splendid stucco façade; the 57-meter-high Stadtturm, a watchtower built in the 14th century, and enjoying the charming town square. 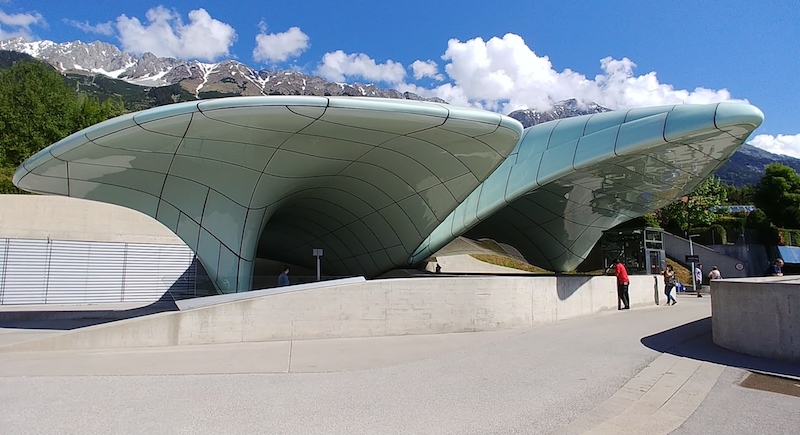 Surprisingly, Innsbruck’s most famous landmark is a roof. The adjacent Court Church, a 16th-century grandiose tribute to Maximilian I, is well worth visiting. Marble reliefs and 28 bronze statues surround this black marble tomb. Although this is referred to as a mausoleum, the tomb is empty! The Holy Roman Emperor’s remains aren’t here; they are buried in a castle south of Vienna. 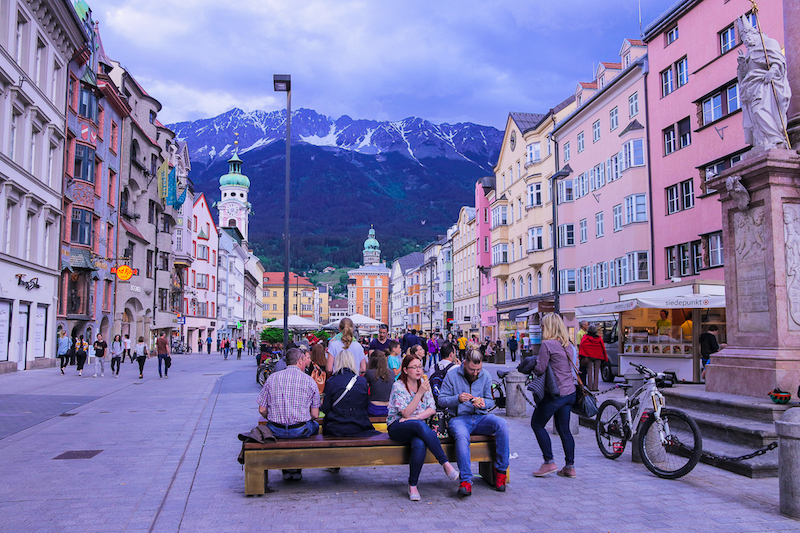 Innsbruck offers plenty of dining options. We joined locals at Café Konditorei Munding, Tyrol’s oldest café, and also dined at the 900-year-old Ottoburg, where each small dining room, with stone arches and wood paneling, had its own historical vibe. The traditional menu included schnitzel, venison stew, and apple strudel. Just a short distance away is the dramatic Bergisel Ski Jump tower, constructed in 2002. Its unusual design offers excellent city views from its 50m-high top. The Bergisel Sky café is a good place to stop for coffee or a light meal and enjoy the panoramic deck. The Nordkett mountain range towers over Innsbruck. This outdoor playground, perfect for skiing and hiking, is part of the Karwendel Alpine Park, Austria’s largest nature park. Getting up to the mountains is easy; we walked from our hotel to Congress Station, right in town, where the 8-minute funicular ride to Hungerburg station starts. One of the highlights of this extremely modern funicular is the extraordinary design of the stations resembling icy glaciers. Stops along the way include the Alpine Zoo, where visitors can experience the alpine animal world with more than 2,000 animals and 150 species. This claims to be the only themed zoo in the world housing such a complete collection of European alpine creatures. After reaching the Hungerburg station, we walked across a small square to the lower station of the cable car and took it to the Seegrube station at 1,905 meters. Here, you can enjoy a leisurely coffee at the restaurant or on the terrace, take an easy walk to a stunning viewpoint, or watch mountain bikers or skiers take on Europe’s steepest ski trail. The young-at-heart can brave a zipline. The Nordkette Climbing Arena, one of the highest climbing areas in the Alps, offers many single-rope routes with options for both beginner and advanced-level climbers. Alternatively, visitors can enjoy spending their time as observers rather than participants. Another cable car goes from here to the Hafelekar station at 2,256 meters, a 15-minute walk to the Hafelekarspitze, the actual summit at 2,334 meters where the views and the clear mountain air are invigorating. Both mountain lift stations are good starting points for hikes to numerous mountain huts and several are suitable for all ages. Check opening times for mountain transport. Opt for good walking shoes when walking uneven cobblestone streets. Be sure to drink plenty of water when at higher elevations. If you have any health conditions, talk with your doctor about appropriate precautions. 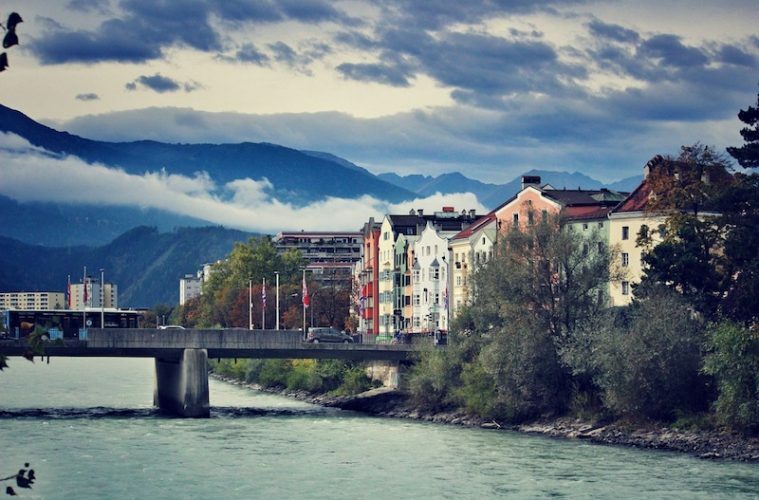 If you are spending several days in Innsbruck, consider purchasing an Innsbruck Card that offers free entry to the city’s museums and main sights; and complimentary public transport, including buses, trams, the cable cars and the Sightseer bus; and a free guided city walk. Slam, bang, bif, pow! I awake to unfamiliar sounds and cautiously pull up the blind. Oh, it’s just two kangaroos having a ‘friendly’ stand-up fight just outside my window. 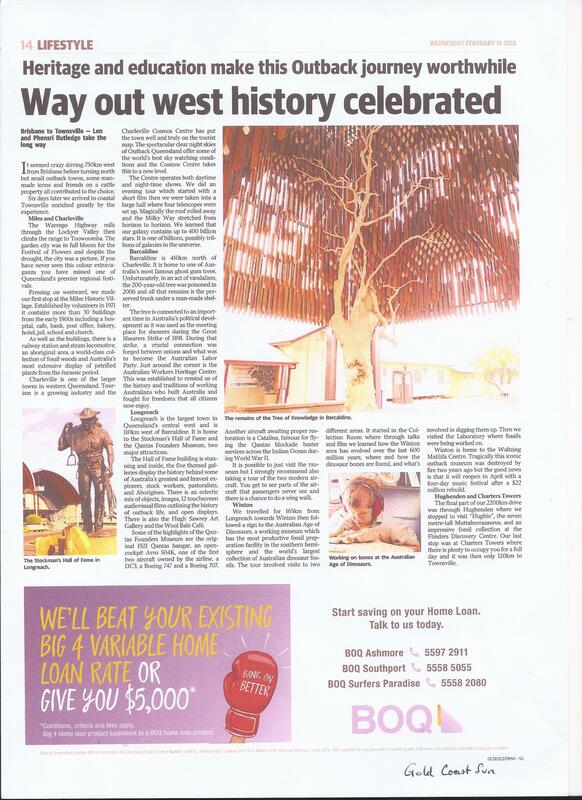 There’s nothing unusual about that at Undara, four hours or so by road from Cairns or Townsville. I’m rapidly discovering that very few things are considered unusual at Undara. The wildlife, the vegetation, the lava tubes and the railway carriage accommodation would all be considered very different elsewhere but here they are part of the amazing Undara Experience (www.undara.com.au ). It takes a while to sort out the Undara Experience. The whole package consists of accommodation, meals and facilities, tours and activities. You can cherry-pick bits and pieces but you will find that more is always better because this experience is very special. For accommodation, we choose the beautifully restored one hundred year old railway carriages. The rooms contain a very comfortable double bed, old railway seats ceiling fans, and a bathroom. We watch the sunset while enjoying sparkling wine and cheese and then are taken to the entrance of a lava tube at dusk to see pythons and tree snakes capturing a meal of micro bats as they emerge from the darkness in their thousands. Dinner at night is at the Iron Pot Bistro. The a-la-carte menu has beef, Georgetown sausages, chicken, fish, and vegetarian noodle stir fry dishes. Meals are large, delicious and filling.. After dinner, we relax around the campfire, enjoy the brilliant starry sky then wander back through the Australian bush to our railway carriage ‘home’ for a good night’s sleep. It’s morning. There are wallabies, wallaroos, parrots, kookaburras, currawongs and magpies all happily going about the business of eating. I guess it is time for our breakfast. It’s 8am and we gather for the Archway Explorer tour. Lava tubes are the result of volcanic lava flowing down depressions. Eventually the surface cooled and formed a crust but underneath the lava continued to flow. 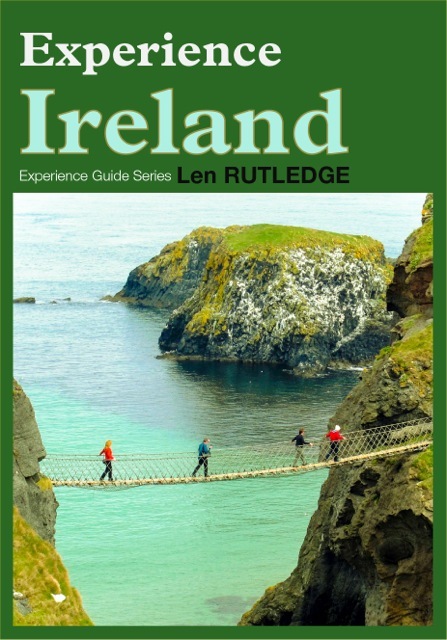 Len Rutledge heads about as far North as you can go. Norway is a big country. 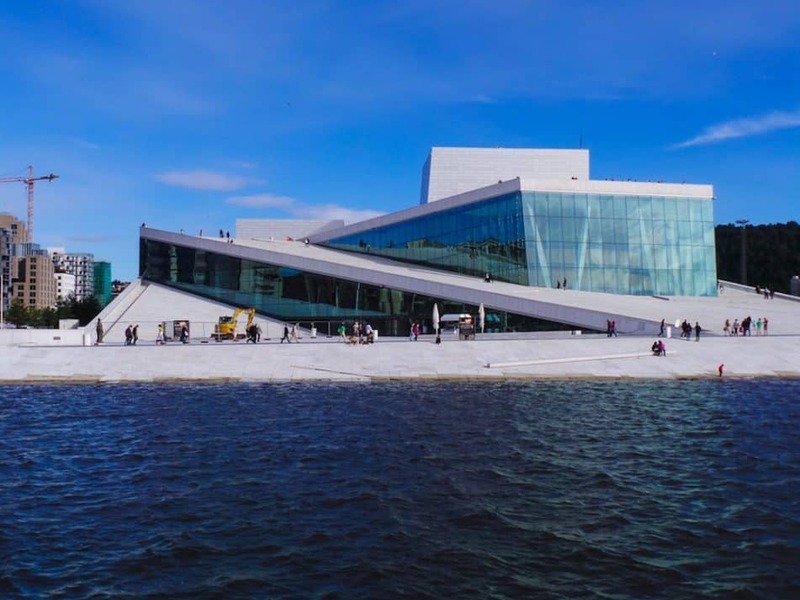 Oslo, the capital is in the south. Alta, where we are heading is over 1700 kilometres to the north. Fortunately, there is a direct flight. At the airport, we rent a car and head out to explore an area that is radically different to anything in Australia. People have lived here for more than 10,000 years. The major site of interest is the Alta Museum. 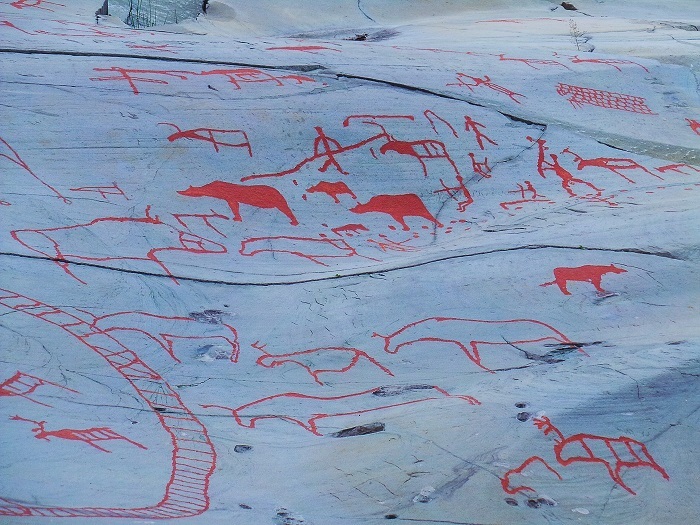 There is an excellent indoor exhibition explaining the local rock art and giving a broader introduction to Finnmark’s prehistory. 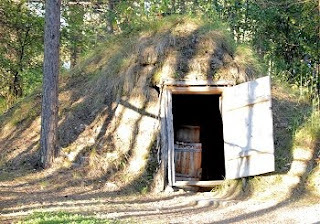 The exhibition also teaches us that in the Sámi (Laplander) religion, nature was regarded as possessing a soul and being alive. 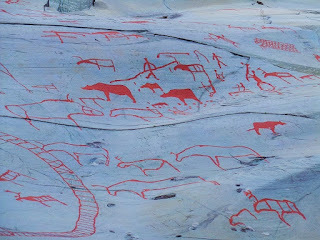 Alta Museum is linked by a boardwalk to a UNESCO World Heritage Rock Carving site where there is a series of carvings from up to 7,000 years ago. These are extensive and took an hour to enjoy. Approximately 3,000 figures have been found here making it one of the largest collections in Europe. The modern Northern Lights Cathedral is both a church and a northern lights attraction. The nearby central square is traffic-free and good for a short wander. There are tours to the 300-metre-deep Sautso-Alta Canyon, and to mountain bike paths near the Alta River. The bleak country south and east of Alta is the home of the indigenous Nordic people, Sámireindeer-herders. Frankly, it is only the Sámi culture that is of great interest here and this can be depressingly difficult to see in the middle of summer when many Sámi have moved to the coastal pastures. 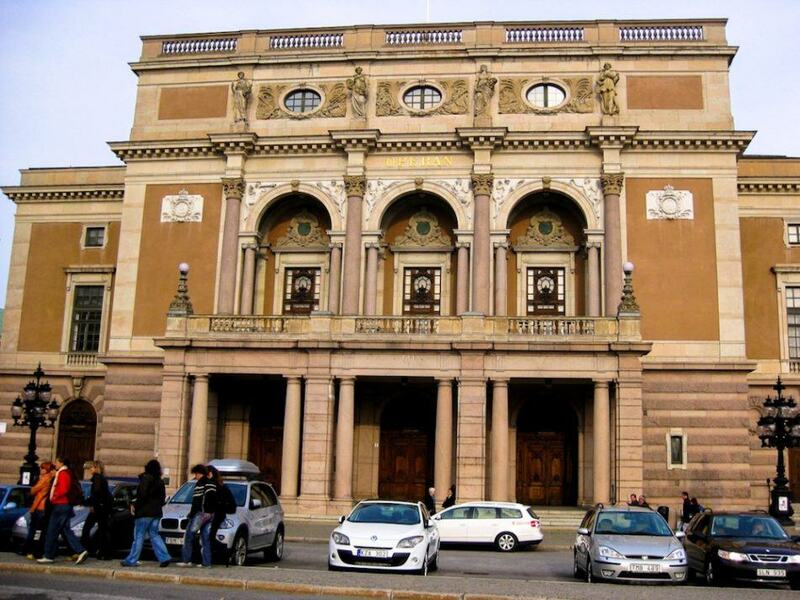 The best time to visit is during the Easter festival when there are concerts, church services, and traditional sports. Kautokeino is a permanent town and the principal winter camp of the Sámi people but it is a somewhat desolate place strung out along the highway. 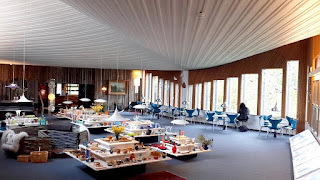 A couple of kilometres south of town is Juhis Silver Gallery, an amazing attraction with a workshop and a wonderful display area. In the centre of a major city, this would be a sensation, here in the wilderness it is mind-blowing. The items being produced here are mainly sold in the exclusive boutiques of Europe and North America. Karasjok is the capital of the Sámi and is more organized than Kautokeino. It is only 18 km from the Finnish border and here we find the Sámi parliament and several museums and attractions. The Sami Artists Centre is an art gallery devoted to Sami painters. Don’t miss it. We travel further north through the treeless and barren landscape to Hammerfest on the shore of rugged Kvaloya Island. This is the world’s northern-most substantial town and amazingly, it was the first place in Europe with electric street lighting. The town was totally leveled during World War II and the interesting Reconstruction Museum details the dramatic events including the forced evacuation of the population, the town burning to the ground, and the subsequent reconstruction. You don’t have to go far to see roaming reindeer herds. 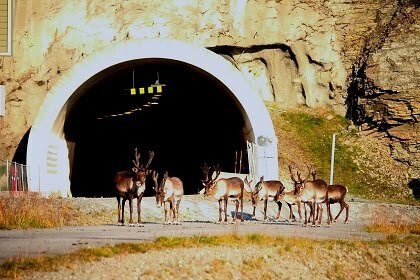 We encountered one at the entrance to a substantial tunnel on the main road not far from town. 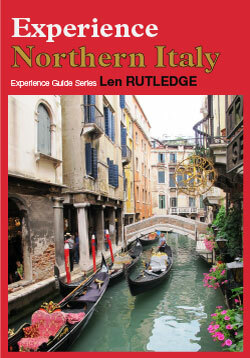 If boating is your thing, there are trips to several little fishing villages along the rugged coast. North Cape/Nordkapp is touted as the most northern point of continental Europe. 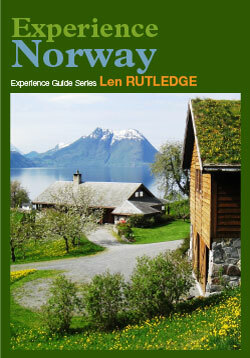 Near North Cape, there are several alternatives. Skarsvag, the nearest fishing village, has boat trips, fishing, bird-watching, and whale safaris. Cycle and kayak rental are also available. In the same area, the Church Gate rock formation offers excellent views of North Cape, the Horn, and the midnight sun. North Cape has been a visitor attraction for several hundred years. You can only enter this area after paying a fairly hefty fee but we found it worthwhile. Outside you can see the King Oscar Monument which was built in 1873 to mark the outermost limit of the Norway-Sweden union. 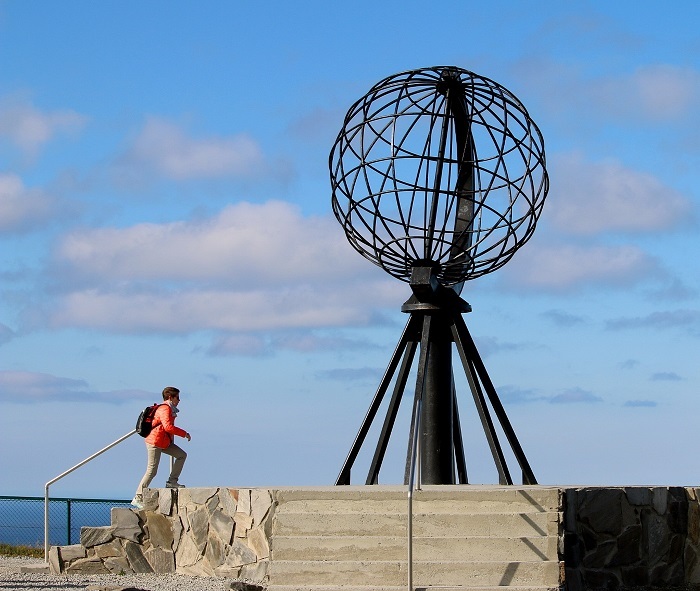 The Globe monument erected in 1977 has become the symbol of the North Cape and is a popular photographic spot. North Cape Hall is a large tourist center with a host of facilities including a film on a wrap-around screen about the four seasons. The Tunnel has exhibitions about the North Cape’s long history as a tourist destination and this leads to St Johannes Chapel which is the world’s northernmost ecumenical chapel. Nearby is a Thailand Museum because this spot was visited by King Chulalongkorn more than 100 years ago. Finally, we reach the Cave of Light which is a new attraction providing a journey through the seasons by way of sound and light. It is still 530 kilometres to Kirkenes near the border with Russia. This was bombed more often than any place in Europe except Malta during World War II. This area is so remote from Oslo that Finland and Russia have had more influence on the area than Norway at various times. You see this in the church architecture and even in some of the language.